I was intrigued by the synopsis of this non-fiction book and jumped at the chance to review it for TLC Book Tours. “I’ve often heard people debate the entangled relationship between race and class. ‘Which one is the real issue?’ people ask. ‘Is it race or is it class?’ I’ve wondered myself how my socioeconomic advantage versus my skin color advantage shaped my life and skewed my worldview. I’ve come to believe it’s not an either/or issue. Both are real, and both matter. Trying to determine which one is the ‘real’ issue does a disservice to both. Concluding class is the real issue would give me permission to avoid thinking about race. Similarly, assuming race is the more significant issue overlooks the complications faced by white people caught in a vicious cycle of poverty. Both can trap people in a kind of second-class citizenship. If you can’t get the education you need to get a job to pay for healthy food, medical care, transportation, and a home in a neighborhood with good schools, then you can’t educate your children in a school that will prepare them for a job that will . . . and so on. Any cycle that traps someone in a state of perpetual disadvantage is the real issue for the person experiencing it. 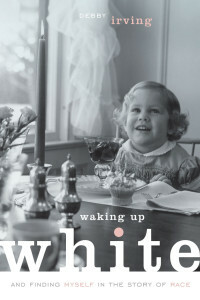 In Waking Up White, Debby Irving recounts her odyssey to delve into issues of race that over the course of her life impacted relationships and her worldview in ways that she wasn’t able to understand until she began to actively learn about race – including whiteness. Having grown up in an affluent world populated almost entirely by white people, Irving grew up with the belief, like many people, that success in life depends solely on one’s own merit and determination, and the opportunities available in America are available to everyone. One of her first wake up calls was when she discovered that her father, who had fought in WWII, was able to buy his first home and attend law school courtesy of the GI Bill, but that the vast majority of black men who fought in WWII were denied the benefits of the GI Bill, and that in the post WWII era as housing developments exploded across the nation, neighborhoods were “redlined,” preventing people of color from moving into white neighborhoods, thereby virtually guaranteeing a cycle of more affluent neighborhoods being populated by whites and poorer neighborhoods by blacks, Hispanics, and other non-white minorities. Although the practice of “redlining” may no longer exist, the cycle certainly still continues today, with the vast majority of middle-class, upper-middle class, and affluent neighborhoods across the country being populated mostly by whites, and lower-middle class and poor neighborhoods by non-white minorities. And then we have the audacity to make moral judgments about the people who populate each type of neighborhood. Irvine acknowledges that for the longest time, she believed as many of us do – that “racism” means being openly intolerant or hostile concerning those of different races. Most of us do not believe ourselves to be racist and would be indignant at the suggestion that we might be, but the truth is that whether we buy into and/or perpetuate stereotypes, or hold some nebulous belief that “they” would be better off if they could just be more like “us,” most of us are racist in one way or another, to varying degrees. Perhaps the most insidious form of racism is failing to recognize and acknowledge white privilege. There are really so many quotes I could pull from this book; I was dog-earing pages and highlighting passages from beginning to end. Extremely well-written, thought-provoking, and eye-opening, I want all of my white friends to read it. I want my kids to read it at some point. I think it’s a book that needs to be read, and a conversation that needs to be had, by every American. To read more about Debby Irving and race, check out her website: debbyirving.com. We have much more to do and books like this are important and necessary. It’s true that many people believe everyone in America is born with the same opportunities, and that’s a naive viewpoint. Or worse, a purposefully blind one. I agree that this is a fabulous book to share with your children – what a way to open their eyes and your own at the same time. I’ll definitely be looking for a copy to share with my son.